This option is, again, popular for school visits as part of the whole KS2 Invaders and Settlers topic. Our Anglo-Saxon characters are heavily influenced by Bede’s World, at Jarrow. I have been a member of the Estate Management Committee there for over 10 years, advising on the livestock. Paul has built clay ovens there that we have used for cookery demonstrations. Paul and the former director, Chris Grocock, gained a lot of local publicity by taking one of our own, small, Dexter bulls into a china shop in the Metro Centre. Ruth has provided demonstrations of textile crafts, spinning, tablet weaving and warp weighted loom weaving, for Bede’s World. 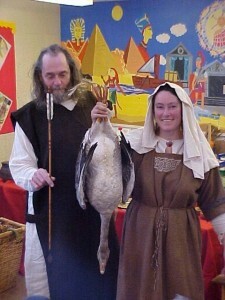 Ruth first became associated with Rent A Peasant when we all spent a week at the Metro Centre as Anglo-Saxons, with live animals, to promote Bede’s World. 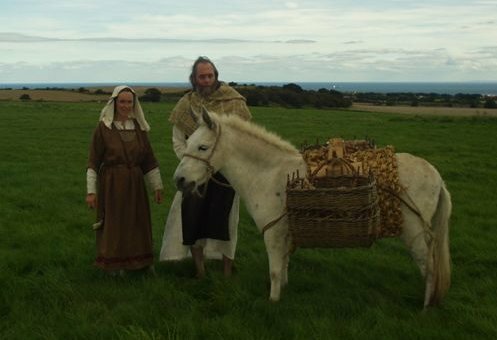 Chris has been involved with running the Anglo-Saxon farm to give the present farm manager a holiday. Egbert and Withburga were given to the monastery as child oblates, a far happier fate than being sold into slavery by parents who could not afford to keep all their children. We remain lay brethren, involved with the practicalities of running a large establishment. Many celtic monasteries had houses for both monks and nuns, as their complementary skills made for a more successful community. Egbert has agricultural duties, particularly cattle rearing. Lots of calves were needed to make the vellum on which to write the manuscripts, such as the Lindisfarne Gospels. The oxen plough the fields to grow the crops to feed the community. The garden supplies vegetables and is home to the bee hives. The beeswax makes the church candles and the writing surface for wax tablets, used as note books. 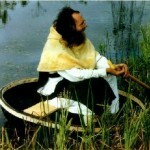 The shepherd is also an important character, no warm clothes without wool! These humble callings were appropriate to the Christian ethos with Caedmon, the ox herd at Whitby, being granted the vision of a song and St Cuthbert received his calling to God while a shepherd in the Borders. Withburga follows the immemorial work of women, spinning and weaving the wool for clothes. Withburga takes the time to embroider decoration on her own clothes, as well as the church vestments. The dairy and food preparation are also women’s work. Withburga looks after the geese too. The flight feathers from their wings are carefully collected when they moult, to make quill pens in the scriptorium. Brother Egbert & Sister Withburga at St Anne’s Primary School, Bishop Auckland. 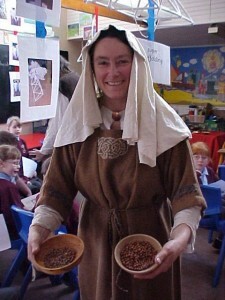 Sister Withburga with dried peas & beans, staple foods for winter.